Nigel Williams-Goss (born September 16, 1994) is an American professional basketball player for Olympiacos of the Greek Basket League and the EuroLeague. He was selected by the Utah Jazz, with the 55th overall pick in the 2017 NBA draft. He played college basketball for the Gonzaga Bulldogs. He spent two seasons with the University of Washington's Huskies, before deciding to transfer before the 2015–16 season. At a height of 1.92 m (6'3 ​3⁄4") tall, his main position is point guard, but he can also play shooting guard. Nigel Williams-Goss played high school basketball at Findlay Prep in Henderson, Nevada and was the program's first 4-year player and helped lead the team to a 124-8 record, including winning the High School National Championship in 2010 and 2012. He maintained a 4.0 GPA throughout his time in high school, while attending classes at Henderson International School. MaxPreps named WIlliams-Goss an honorable mention sophomore All-American in 2011. After helping lead Findlay Prep to a High School National Championship, while averaging 15 points, 4.9 assists, and 4 rebounds per game, he was named a third-team junior All-American by MaxPreps in 2012. Williams-Goss was named as to the prestigious 2013 McDonald's All-American Game Against the best high school seniors in the nation, he scored 10 points along with 6 assists, 2 rebounds, 2 blocks, and a steal, while shooting 4-for-6 from the field and 2-for-2 from the free throw line. He also won the 3-point contest during the McDonald's All-American game festivities. Williams-Goss was also invited to the Jordan Brand Classic, where he led the West team to a 102–98 victory over the East, delivering the game-winning basket, in which he stole the ball and converted a three-point play after sinking a layup and heading to the foul line for an additional point. He finished with 17 points, 4 assists, 3 rebounds, and 1 steal on 5-for-6 from 2-point range, 1–1 from beyond the 3-point arc, and 4-of-5 from the free throw line in 20 minutes of play. "He is a great floor general. He is very intelligent and has high, high basketball I.Q. He understands what it takes to win and is a great leader. Guys like him don't come around very often." — Lorenzo Romar, Washington Head Coach. In December 2010, after beginning his sophomore year at Findlay Prep, Williams-Goss announced his commitment to UNLV. At the time he was being heavily pursued by the Rebels, along with Arizona, Washington, Oregon, and Oregon State, with increased interest from Georgetown and Connecticut. In April 2011, Lon Kruger jumped ship from the head coaching job at UNLV to become the new head coach at Oklahoma. Two weeks later, Williams-Goss decommitted from UNLV, giving other programs, including the Rebels' coaching staff a chance to court him. Even though he re-opened his recruitment, William-Goss was still interested in attending UNLV and visited there many times, but after his junior year in high school, he planned visits to Harvard, Washington, Oklahoma or Missouri In May 2012, Williams-Goss pledged his commitment to Washington. He signed with the Huskies during the early signing period later that year. "2013 Washington Rivals Commits". Rivals.com. Retrieved April 15, 2016. "2013 Washington Scout Commits". Scout.com. Retrieved April 15, 2016. "2013 Washington ESPN Commits". ESPN.com. Retrieved April 15, 2016. "Scout.com Team Recruiting Rankings". Scout.com. Retrieved April 15, 2016. "2013 Team Ranking". Rivals.com. Retrieved April 15, 2016. "2013 Washington 24/7 Sports Commits". 247sports.com. Retrieved April 15, 2016. As a freshman, Williams-Goss started every game, while averaging 13.4 points, 4.4 assists, 4.4 rebounds, and 1.1 steals. His stellar season earned him a selection to the All-Pac-12 Freshman Team. He led the Pac-12 conference freshmen in scoring, assists, and assist-to-turnover ratio (1.6). He set a new UW freshman single-season record with 140 assists. Despite his phenomenal year, UW finished with a disappointing 17-15 record (9-9 in Pac-12 games), losing in the first round of the Pac-12 Tournament to Utah, and missed the postseason for the first time since 2007, after declining an invitation to the CBI. In his first collegiate game, he posted 6 points, 6 assists, 3 rebounds, 3 steals, and a season-best 1 block on 2-for-7 field goal shooting and 2-for-2 from the free throw line in an 88-78 win over inner-city rival Seattle University. On November 17, he had 22 points, 6 rebounds, 5 assists, and a season-high 3 steals on 9-for-15 from the field and 4-for-5 from the charity stripe in a 92-80 win over Eastern Washington. On November 26, he scored 20 points, along with 6 assists and 3 assists on 5-of-8 2-point shooting, 1-of-1 from 3-point, and 7-of-8 free throws in an 83-79 win over Montana. On January 18, 2014, Williams-Goss posted 17 points, 7 rebounds, 6 assists, and 1 steal on 3-for-7 2-pointers, 3-for-5 from 3-point land, and 2-for-3 free throws in a 79-67 loss to Stanford. On January 25, he set a new UW freshman single-game scoring record with 32 points in come-from-behind 87-81 win over Oregon State, in which he shot 7-for-11 from 2-point range, a season-best 3-for-4 from beyond the 3-point line, 9-for-10 from the free throw line, along with 5 rebounds, 3 assists, 1 steal, and zero turnovers. On February 22, Williams-Goss dished out a season-high 10 assists to go along with 14 points, 2 rebounds, and 1 steal on 7-for-10 field goal shooting in an 86-62 win over Oregon State. On February 28, he grabbed a season-high 12 rebounds, along with 17 points, 4 assists, and 2 steals on 6-of-10 2-point field goals, 1-of-2 3-pointers, and 2-of-3 free throws om 30 minutes, in a 72-49 win over cross-state rival Washington State. As a sophomore, he led the 2014–15 Huskies in points (15.6 scoring average) and assists (5.9 per game). He also contributed 4.7 rebounds and 1.1 steals per game, while starting in 30 of the team's 31 games. His standout sophomore season earned him second-team all-conference in the Pac-12. He was also named as a third-team Academic All-American, while boasting a 3.74 cumulative GPA in pre-social science. Washington began the year with an 11-0 record, including impressive wins over Oklahoma and San Diego State, matching the best start in Lorenzo Romar's tenure as the Huskies' coach. Despite such a promising start, Washington would lose 15 of its last 20 games, finishing with a 16-15 record (5-13 in Pac-12 games), losing in the first round of the Pac-12 Tournament to Stanford, and missed the postseason yet again, after declining an invitation to the CBI. In his first game as a sophomore at Washington on November 14, 2014, Williams-Goss grabbed a career-high 12 rebounds, along with 10 points, 7 assists, 2 steals, and 1 block on 5-of-5 2-point shooting in a 77-59 win over South Carolina State. On November 28, he dished out a career-high 12 assists to go along with 21 points and 7 rebounds on 6-for-14 field goals and 5-for-6 free throws in an 80-70 win over Long Beach State. On January 2, 2015 in an 81-75 loss to Cal, Williams-Goss came the closest to a triple-double in his college career, posting 19 points, 9 assists, and 8 rebounds on 7-for-16 from the field and 5-for-6 from the free throw line. In an 80-77 loss to Washington State on January 10, Williams-Goss dropped 30 points, 7 rebounds, 5 assists, and career-highs of 3 steals and 1 block on 13-for-22 field goals and 4-of-4 from the charity stripe. In a loss to Cal on February 1, he posted a season-high 31 points along with 6 rebounds, 5 assists, 1 steal,and zero turnovers on 8-of-11 2-pointers, 3-for-6 3-point field goals, and 6-of-6 free throws. On February 15, he had 20 points, 6 assists, and 5 rebounds on 6-of-15 within the arc, 1-of-3 beyond the 3-point arc, field goals and 5-of-5 free throws in a loss to Arizona State. In a win over Washington State on February 22, he had 20 points, 7 assists, 3 rebounds, and 2 steals on 6-of-10 2-pointers, 1-for-3 from 3-point land, and 5-of-8 free throws. In the regular season finale against Utah on March 7, WIlliams-Goss posted 28 points, 6 rebounds, 3 assists, and 2 steals on 10-for-16 2-point field goals, 1-of-2 3-pointers, and 5-for-7 free throws in a 77-68 win over #13 Utah. "Nigel is a proven high-level player who possesses all of the qualities that we admire here at Gonzaga. He’s a very driven, team-oriented guy and is excited to be a part of this program. He’s also been great in the classroom as an Academic All-American, which fits in with our history of academic success. We are really excited to get him in here and help him develop the next part of his game." — Mark Few, Gonzaga Head Coach. In April 2015, Williams-Goss announced he was leaving Washington and transferring to another school. Even though he had a great relationship with Coach Romar and his teammates, he was uncomfortable with the changes surrounding the program and the team's consistent losing. He initially claimed he was considering UNLV, Texas, Georgetown, Michigan State, Arkansas, and Gonzaga. A couple days later, he said he would take visits to UNLV, Providence, Texas, and Georgetown, with Michigan State also in the mix. After visiting UNLV and Providence, Williams-Goss cut his list to 4 (UNLV, Providence, Gonzaga, and Ohio State), with plans to visit Gonzaga and Ohio State. He called off his trip to Ohio State after committing to Gonzaga during his recruiting trip. He would have to redshirt the 2015–16 season before having two years of eligibility to play at the beginning of the 2016–17 season. Williams-Goss cited the Zags' track record of developing players during their redshirt year, winning at a high level, and their up-tempo offense which includes a ton of ball screens for his commitment to Gonzaga. Throughout his junior season, Williams-Goss provided his best season in college with his only season in Gonzaga. In 38 games he played with for Gonzaga, he recorded the most points off of his best overall shooting percentage, rebounds, and steals per game while also playing the fewest minutes per game throughout his college career. In addition to those results, he was also named the West Coast Conference's Newcomer of The Year and the West Coast Conference's Player of The Year, as well as became a member of the All-West Coast Conference First Team, a member of the Academic All-American First Team, and was a consensus All-American Second Team for the help he provided for the 37–2 Gonzaga Bulldogs. Not only that, but he also helped lead Gonzaga to its first ever NCAA Championship match, where they ultimately lost to the North Carolina Tar Heels. After the end of the NCAA Tournament, Williams-Goss was one of a record-high 182 underclassmen to declare for the 2017 NBA draft, with him signing up with an agent on the day of his declaration. On June 23, 2017, Williams-Goss was selected by the Utah Jazz as the 55th pick of the 2017 NBA draft. After playing for the Jazz in the 2017 NBA Summer League, he signed a two-year contract with Serbian club Partizan on August 28, 2017. On February 18, 2018, Williams-Goss recorded 23 points, along with 7 assists, 3 rebounds and 2 steals, and led Partizan to win the Serbian 2018 Radivoj Korać Cup, after an 81–75 win over Crvena zvezda. He was subsequently named the Serbian Cup MVP. In 46 games played during the 2017–18 season (played in the EuroCup, ABA League, Serbian League, and Serbian Cup competitions), Williams-Goss averaged 17.3 points, 7 assists, 3.4 rebounds and 1.2 steals per game. On July 5, 2018, Williams-Goss signed a three-year deal with Greek team Olympiacos, of the EuroLeague. Williams-Goss helped the USA win a gold medal in the 2013 FIBA Under-19 World Cup in the Czech Republic, while averaging 7.9 points, 2.8 rebounds, 2.7 assists, and 0.8 steals, while shooting 49.1 percent from the field, 42.1 percent from beyond the 3-point line, and 90 percent from the free throw line. ^ WILLIAMS-GOSS, NIGEL OLYMPIACOS PIRAEUS HEIGHT: 1.92. 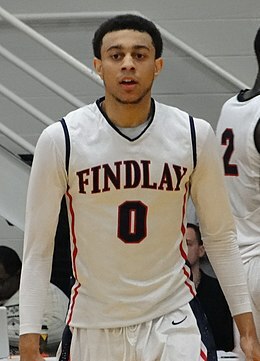 ^ a b "Findlay Prep's Nigel Williams-Goss named to McDonald's All-American team". February 14, 2013. ^ "Nigel Williams-Goss' Strong Faith Paves Way To Success". June 17, 2013. ^ "Boys Basketball Sophomore All-American Team". April 21, 2011. ^ "Boys Basketball Junior All-American Team". April 16, 2012. ^ "MaxPreps 2013 Boys Basketball All-American Team". April 11, 2013. ^ "Nigel Williams-Goss makes Parade All-America team". May 22, 2013. ^ "Nigel Williams-Goss shines at McDonald's All-American game". April 3, 2013. ^ "California Supreme Alumni Nigel Williams-Goss Shines in 2013 Jordan Classic Making the Game Winning Shot, and Leading the West Roster with 17 Points". April 14, 2013. ^ a b "Romar Signs Another Guard To Next Year's Class". November 16, 2012. Archived from the original on May 14, 2016. ^ "Findlay Prep sophomore guard Nigel Williams-Goss verbally commits to UNLV". December 15, 2010. ^ "Findlay Prep sophomore Nigel Williams-Goss officially de-commits from UNLV". April 17, 2011. ^ "Updates from Findlay Prep on UNLV recruits Anthony Bennett, Nigel Williams-Goss and Chris Wood". April 19, 2012. ^ "Special player blog: Williams-Goss commits". May 30, 2012. ^ "2013-14 Pac-12 Conference Men's Basketball Honors". March 10, 2014. ^ a b "Washington Basketball Profile: Nigel Williams-Goss". Retrieved April 16, 2015. ^ "Official Basketball Box Score - Seattle University vs Washington" (PDF). November 10, 2013. Archived from the original (PDF) on June 1, 2016. ^ "Nigel-Williams BOSS: Freshman Leads UW Rally Over EWU". November 17, 2013. ^ "3-J Wilcox Rescues Huskies In 83-79 Rally Past Montana". November 26, 2013. ^ "Stanford Hands Washington 79-67 Loss". January 18, 2014. ^ "Nigel Williams-BOSS: Freshman's Record 32 Points Beat Oregon St. 87-81". January 25, 2014. ^ "Wilcox, Williams-Goss Lead UW Uprising At Oregon St In 86-62 Win". February 22, 2014. ^ "Williams-Goss, Andrews Lead Huskies' 72-49 Roll Over WSU". February 28, 2014. ^ "2014-15 Pac-12 Conference Men's Basketball Honors". March 9, 2015. ^ "NWG Named Capitol One Third Team Academic All-American". February 26, 2015. Archived from the original on June 1, 2016. ^ "Huskies Cruise Past SC State, 77-59". November 14, 2014. ^ "Williams-Goss' Double Double Lifts UW Past Long Beach State, 80-70". November 28, 2014. ^ "No. 21 Men's Basketball Drops Pac-12 Opener to California, 81-75". January 2, 2015. ^ "Dawgs Fall to Washington State, 80-77". January 10, 2015. ^ "Dawgs Suffer 90-88 Loss to California". February 1, 2015. ^ "Washington comes up short, falls to Arizona State 78-68". February 15, 2015. ^ "Andrew Andrews' Late Three Lifts Huskies Over Cougars". February 22, 2015. ^ "Huskies Upset No. 13 Utah, 77-68, on Senior Day in Seattle". March 7, 2015. ^ a b "Gonzaga Men's Basketball Adds UW Transfer Nigel Williams-Goss". May 6, 2015. ^ "Nigel Williams-Goss explains why he's leaving Washington". April 10, 2015. ^ "Washington transfer Nigel Williams-Goss told @CBSSports he is considering UNLV, Texas, Georgetown, Michigan State, Arkansas, and Gonzaga". April 10, 2015. ^ "Nigel Williams-Goss told @CBSSports he will visit UNLV this wknd, Providence (4/25), Texas (5/1), + Georgetown (5/8). Mich St also in mix". April 14, 2015. ^ "Nigel Williams-Goss told @CBSSports he will visit Ohio State on 5/8. Visits Gonzaga this weekend. Also considering PC + UNLV. List cut to 4". April 27, 2015. ^ "Gonzaga Basketball: Introducing our newest Zag, repping #5 Nigel Williams-Goss! Welcome to the squad Nigel!". May 6, 2015. ^ "Sports-Reference Profile: Nigel Williams-Goss!". Retrieved April 20, 2016. ^ "Najdžel Vilijams-Gos dve godine u Partizanu". kkpartizan.rs (in Serbian). August 28, 2017. Retrieved August 28, 2017. ^ "Partizan NIS winner of the Triglav Insurance Radivoj Korac Cup 2018!". kss.rs. February 18, 2018. Retrieved July 5, 2018. ^ "Olympiacos pens Williams-Goss to multiyear deal". EuroLeague.net. July 5, 2018. Retrieved July 5, 2018. ^ "ELEVENTH FIBA MEN'S U19 WORLD CHAMPIONSHIP – 2013". August 7, 2013. Wikimedia Commons has media related to Nigel Williams-Goss.